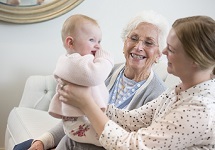 There are a number of reasons why people choose to move into a retirement village; looking for more security, wanting to live in a lifestyle community, a partner’s passing, feeling socially isolated, or wanting the ease and convenience of extra care when required. Retirement villages are a great decision for those looking for a sense of community, which can increase quality of life. Common concerns range from not wanting to leave the neighbourhood and the family home, not wanting to part with possessions, feeling of abandonment, to worrying about maintaining independence. Understanding these worries and fears is important if you are looking to talk to a parent, grandparent, sibling or friend about retirement options. If you are contemplating the move into a retirement village yourself, then you are probably already aware of the great convenience that comes with moving to the village lifestyle. In fact, it may be your kids who are hesitant about selling of the family home. You too can make use of some helpful talking points in raising a discussion about retirement lifestyles. Do you worry about your Mum and Dad’s safety? Do you have a Grandparent(s) that needs extra care and attention with their daily routines? Has juggling a loved one’s health appointments, errands and necessities become a full-time job on-top of your full-time job? Does your Sibling want the freedom of not having to worry about the hassle of a big home and all the chores that come with it? Do you worry about a Friend and their health and well-being? Have you reached a time in life where balancing everyday demands has become more and more difficult? If you answered “yes” to any of the above questions, then you probably have already been thinking of retirement lifestyle options for your parent, grandparent, sibling or dear friend. You may be wondering what to do next to ensure you or they are safe and enjoying life. Opening discussion is one of the first steps. Appreciate why it’s so difficult – Change isn’t easy and this can be especially true as we get older. Older parents want to feel that they are still independent and in control of their lives. For many elders, a fear of abandonment if they move is hard to overcome. Understanding your loved one’s viewpoint helps, as the hardest part can be just starting the conversation. Consequences of not speaking up can be worse than the discussion itself – Accidents and injuries happen, but don’t wait until it’s too late. A parent who’s a hazard on the road or forgetting to turn off the stove can be a worry. Parents can be good at “hiding” their difficulties when you pop by for a planned visit. It’s when you swing by unexpectedly that you might realise how empty the fridge and cupboards are or how the housekeeping is becoming unmanageable and a health risk. Starting the discussion earlier rather than later will benefit everyone in the long run. Do your research – Being prepared and having done research helps. Retirement villages aren’t what they used to be 20 years ago! Many people carry prejudices around thoughts of “retirement options”, but these may be based on images and ideas that are largely a thing of the past. Today’s retirement villages offer retirement living at its best. These are the years to enjoy life, focus on yourself and your hobbies. Many are surprised at how much better life can be. So, pop in for a visit and see what villa, apartment, serviced apartment or care facility is right for your family needs. Think gains, not losses – How will your parent(s) benefit from a retirement village lifestyle? There is immense peace of mind knowing they have a friendly community, security, as well as access to 24-hour support if required. All parties concerned no longer have to stress about household or gardening tasks. Dad can enjoy his retirement knowing there’s no more worrying about cleaning out the rain gutters and getting up on the roof to clean the chimney. Mum can enjoy the activities she has always wanted to get involved in but could never find the time. Involve a third party – Sometimes talking to Mum or Dad can be difficult if there are tricky family dynamics that get in the way. Sometimes Mum may just be stuck in her ways and isn’t willing to budge from her home even though she’s struggling to manage. In these instances, involving a trusted friend of Mum, her doctor, or faith community may be the neutral third party to help. Good communication skills – How you approach the situation and the language you use will set the scene for positive or negative results. Bear in mind that this topic can be sad for your loved one, but handling it with finesse can make all the difference! Here are some helpful tips for aiding discussion: Ask your loved one for ideas. Listen and don’t be afraid of the silent gaps. By asking open-ended questions rather than closed questions it allows them to answer further in-depth and foster and discuss. It also helps to express your concerns rather than tell your loved one what they should do. If you have a circle of support around you, come together and practise what you want to say when you discuss retirement living choices. Revisit the conversation – Don’t expect to reach a final decision straight away. Many families have multiple discussions on retirement lifestyle options. It’s always best to allow your loved one time to think about the options you have shared with them. Pick a good moment – Maybe after a weekend brunch when everyone is in a good mood, relaxed and has had their daily caffeine fix? Be candid – Humour never hurts and keeping it light-hearted shows you care. We encourage family to take part in the decision making process.